Electrical faults pose a danger and can even cause fatalities if left unattended or dealt with by untrained hands. 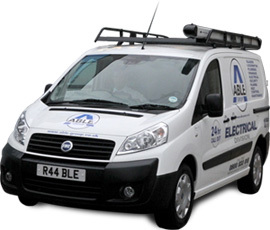 Able Electric realise your safety is at hand and because of this only supply fully qualified electricians who are security vetted for your peace of mind. With the latest in electrical testing equipment any repairs will be done quickly and efficiently. Providing a 24/7 emergency response service, any electrical fault will be attended to within 30-90 minutes and when possible fixed that same day. For any help and advice you can contact our trained 24/7 operational staff on our free phone services. There is no call out charge for this service (diagnostics not included) so you only pay for the time that is spent carrying out the electrical work in hand.